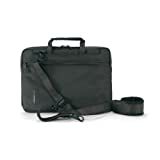 With the iPhone replacing my iPod, cel phone, PDA, and camera (for casual use), and with my switch from older, clunky laptops to the svelt MacBook Air, I decided to downsize my laptop bag / briefcase. My previous bag was pretty small to begin with, but it couldn't beat the slim and lightweight 13" Tucano Workout bag. This classy Italian-made bag is designed for the standard 13" MacBook, but the MacBook Air fits inside perfectly. A lot of people opt for basic sleeves for their Airs, but I prefer to use an actual bag with zipped pockets and slots for business cards, cables, pens, etc. And even after filling the pockets in the Tucano bag, it still remains incredibly small, light, and comfortable to carry. I bought mine at the Flight 001 store in Berkeley, CA, but you can find it online at a variety of sources for under $60. It comes in a few different colors (I chose black).